I have always been detail oriented and a meticulous mis-matcher. 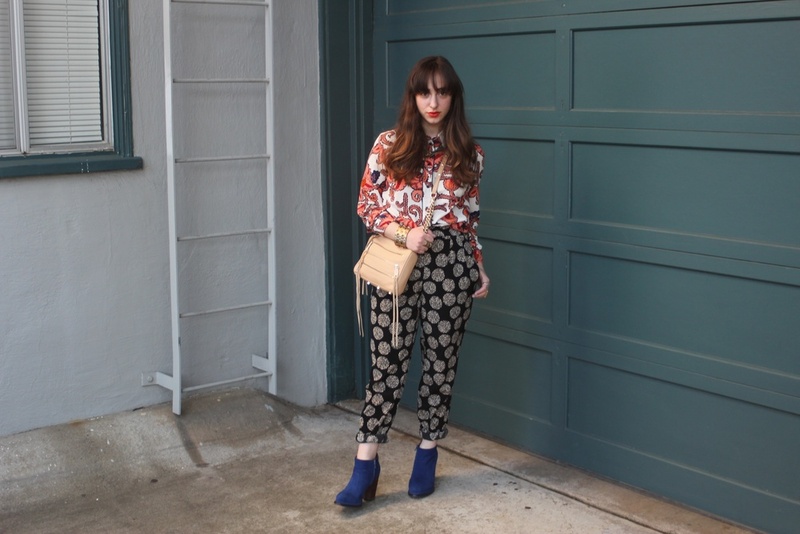 A paisley shirt, medallion printed silk pants, a bright blue suede boot--this outfit is no exception. I first fell in love with this paisley shirt by Topshop in the fall. The bright colors are eye-catching, and I like the trendy brocade-style print that it has. This piece is definitely not your average hippy-style paisley shirt! My favorite aspect of this outfit is the way I cuffed my pants. Lately I have been living in my boyfriend jeans, and I love wearing them with wedges and heeled booties. To put a spin on this popular trend, I cuffed my silk pants to give them that casual yet put-together look of a boyfriend jean. I love taking my favorite trends, and translating them into something fresh for me to do with my wardrobe.